The fascinated journey started on the 05 December 1982. I visited the Vrindavan Ashram of the Sri Sathya Sai Baba at Whitefield in Bangalore, a State in the South of India. The Baba ‘called’ for me. Blessed with a good dose of insight, I knew in advance that wonderful things were going to happen to satiate my hunger for the mystic and the supernatural. Magnificent things did happen in the Divine Presence of the Sri Sathya Sai Baba. Captivated by an unfailing feeling of awe and astonishment, to top the cream of eerie coincidences, quizzical confusion, ambiguous situations and bouts of illusion mixed with reality, I saw a Holy Vision (Sudarshana) of the Sri Baba under the broad daylight! The white marble statue of the Lord Sri Krishna, also known as the Lord of Vrindavan (or The Flute Player) which stood gracefully in the garden of the ashram turned into the living image of the Sri Baba playing the flute under my bewildered eyes! I was stunned! Spellbound! Years after and more precisely in 2013, in an unforeseen event I met a remarkable creative artist, Ankit Sharma, in Jaipur, the capital of Rajasthan. During a conversation which I had with him and by mere coincidence, he told me that his roots originated from a Jangid Brahman family who made statues of God in white marble. I jumped with joy! Ankit was told in minor details about my Holy Vision of the Sai and how the white marble statue of the Sri Krishna metamorphosed into the Baba under my nose and my marveled eyes. In turn, Ankit related to me his secret dreams of the Baba. Embarrass, he admitted that he was not a devotee and had never seen the Baba, yet he had so many dreams of Him. He was bowled over! 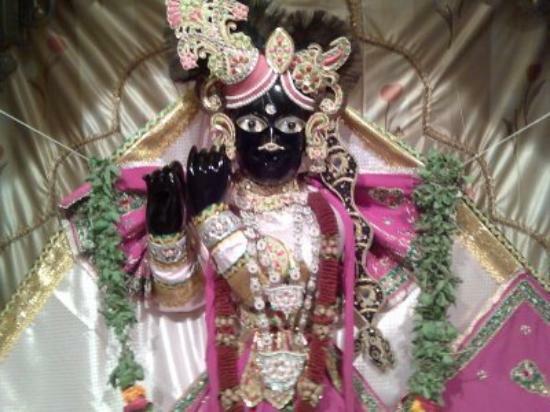 Feeling absolutely blessed and, to discover the true meaning of the holy vision and the secret dreams, we, on the spot and without ado, planned a trip to Vrindavan in Uttar Pradesh, to visit the holy abode of the Lord Krishna. Accompanied by friends and family members, we set out on a five days’vist to Vrindavan on a memorable 29 November 2013.Ankit was our guide! Our schedule consisted of a holy pilgrimage to the Banke Bihari Temple, the Sri Radha Damodar Mandir and the Iskcon Temple, among others. What we found was sheer Beauty! In every cornerstone, in every leaf, every petal, every bead of the “tulsi’ japa mala, every sound, every echo, we found God. There, in Vrindavan, we both received guidance from the Baba to conceive and to bring to life the Sri Sathya Sai Gold Lingam Statue. The task allotted to us was a true blessing. We performed it with humility, faith and great joy. In no time and by the Grace of the Lord we set up our e-commerce. The Gold Lingam which symbolizes the seed of Creation is the exclusivity of Our Baba Idol, made with Pure Unconditional Love, uniquely for Pure Unconditional Love! This entry was posted in Aum Sri Sai Ram, Dreams, Holy Vision, poems and quotes, Poetry of Anita Bacha, sri banke bihari, Sri Radhe Krishna, Statues, supernatural and tagged Aum Sri Sai Ram, Dreams, Holy Vision, Poems and Quotes, Poetry of Anita Bacha, Sri Banke Bihari, Sri Radhe Krishna, Statues, Supernatural by Anita Bacha. Bookmark the permalink.